He couldn’t have put it better: “The goal of the state department is… building bridges…” So spoke Dan Kammen in explaining why he resigned from his role as the US State Department special envoy for science. He joined the president’s arts and humanities committee, which resigned en masse. None of them, of course, can explain why they accepted the posts in the first place or remained in their respective roles up until now. What we are seeing is a tendency towards Bonapartism of two different types, which represents a growing crisis in the capitalist class. On the other side, we are seeing a continued weakness in the US working class, its absence as a cohesive, independent force in society. 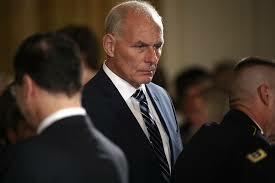 Trump Chief-of-Staff, former General John Kelly. His attempt to bring Trump into line is not succeeding. Right after Charlottesville, Trump gave an off-the-cuff press conference in which he supported the nazis and racists. Then, with the outrage, he read a prepared speech, making a “presidential” condemnation of them. Then, feeling his base, he gave another off-the-cuff commentary supporting the fascists again. Phoenix in which he again reverted to his true self whipping up has base. 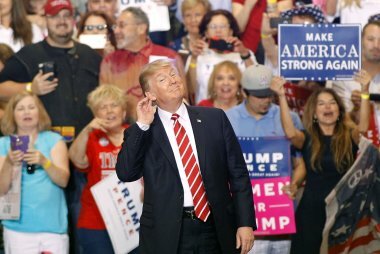 Trump has his supporters among the capitalist class, such as the billionaire Mercer family, but the mainstream of the US capitalist class is beside themselves over the instability that Trump is creating. They understand that the role of the president is to reach out, “build bridges” to hold the tensions within society (and internationally) to manageable levels. It is a symptom of their weakness that despite their mass campaign against Trump (just watch CNN at night) they cannot cut his support to below 35%. Trump represents a tendency towards Bonapartism – rule by some sort of dictator or dictatorship – based on right wing populism. And who is the main force countering this tendency? The US military! In other words, a tendency towards military Bonapartism. You could not get a better example of the weakness of US capitalism. A few people distributed a leaflet to union workers in a few places, including to workers at unionized grocery stores here in Oakland, CA. The leaflet urges union members to make their union stand up to the racist far right. “Isn’t it time your union stood up and organized to put a stop to these racists?” it asks. (See leaflet below.) “Sisters and brothers, you can start a campaign inside your union to make it really lead,” it says. What was the response of the workers? We later were told that several workers were discussing this leaflet. They had thought it was the union leadership that had distributed the leaflet and their response was: “The union wants us to do their thing on this but they can’t even get us a raise.” (Grocery workers have been working without raises for years now.) What does this response tell us? 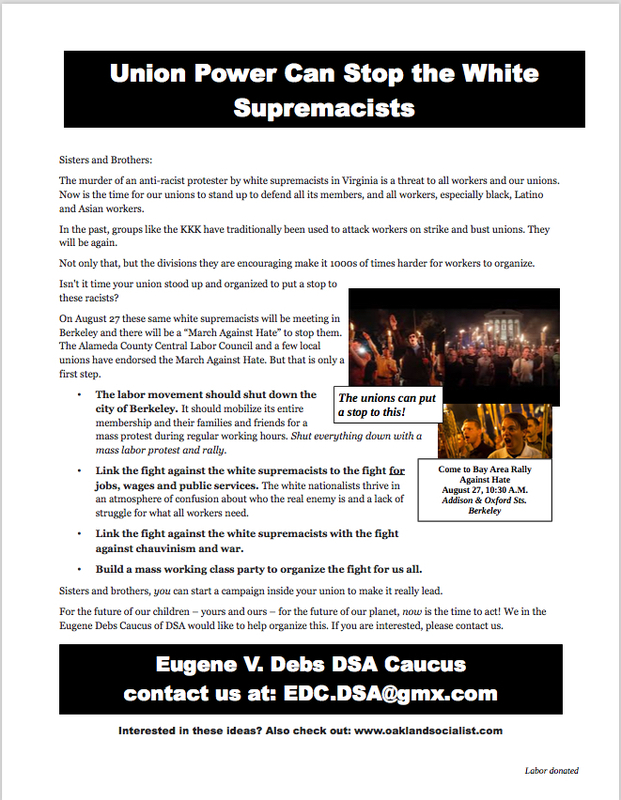 It’s true that the leaflet should have linked up the necessity for the union to lead the campaign against the racists with the necessity to organize to make the union fight for its members on the job. And “the union” in this case really means the union leadership, and these leaders are dedicated to keeping the employers happy by holding down wages as much as they can get away with. It’s up to the members to organize to change the unions. But the willingness to do so among the members is still at a very low level. This is also reflected in the low level of working class participation in the movement against the racists and other anti-working class forces. How did we get to this point? It’s not something new, after all. Even the movement against the Vietnam War was carried out largely (although not entirely) outside the working class. This writer joined the Carpenters Union in 1970. When the union leadership failed in driving him out in the mid ‘70s by blackballing him, they took another tack. When they’d see him talking with a young apprentice in the hiring hall in the mornings, they’d call that apprentice aside. When the apprentice came back, he’d usually move to the other end of the hall. One or two told what had been said to them. “John is a communist. He’s going to get you in trouble. If you want a good career in this trade, you’d best stay away from him.” All you have to do is multiply this example some tens of thousands of times over, and you get a sense of what happened in the unions. Debate around ideas has always been an essential ingredient of the workers movement and the socialist movement. But ideas and views do not exist in the ether; they are carried in the minds of people. In this case that means, the minds of the socialist forces within the working class – exactly those forces which have been so marginalized not only by the capitalist class but also by the very leadership of the working class. This extreme weakness of genuine socialist tendencies within the working class – aside from a few tiny groups who largely orient towards the leadership rather than towards the rank and file – has helped create this generally low level of struggle among the rank and file workers. This has given a greater freedom for the union leadership to capitulate to management, to represent both the employers and one of their two parties – the Democratic Party – within the unions. It has given them the freedom to produce one concessionary contract after another. It has also allowed them to be largely missing in action, to refuse to mobilize their members, in the general protest movements of recent years, such as the Black Lives Matter movement. 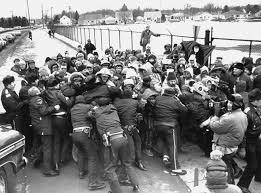 The 1985 Hormel Strike in Austin, Minnesota. It and a series of other such strikes were defeated due to the conservative, timid policies of the union leadership. this is the fact that the US fertility rate in 2016 was down to 62 births per every 1,000 women between 15 and 44 years old. This is the lowest rate in US history! Clearly, tens of millions of young people are deciding that they cannot afford to raise a child. These attacks on living standards were fought, mainly in the early and mid 1980s in a series of strikes, such as the Hormel strike and two strikes at Greyhound Bus Company. Due to the timid and conservative policies of the union leadership, all these strikes were defeated. That combined with the driving out of the socialist tendencies as described to have a serious and long term effect on the consciousness and the mood. What will it take to change all this? Often a great shock is necessary. What sort of shock could that be? Top: US National Guard in Ferguson. Bottom: Trump supporters in Phoenix. It is a symptom of the weakness of influence of the mainstream of the US capitalist class – and the lack of a cohesive working class presence – that the US is threatened with a creeping tendency towards Bonepartism through either military rule or right wing popularism. 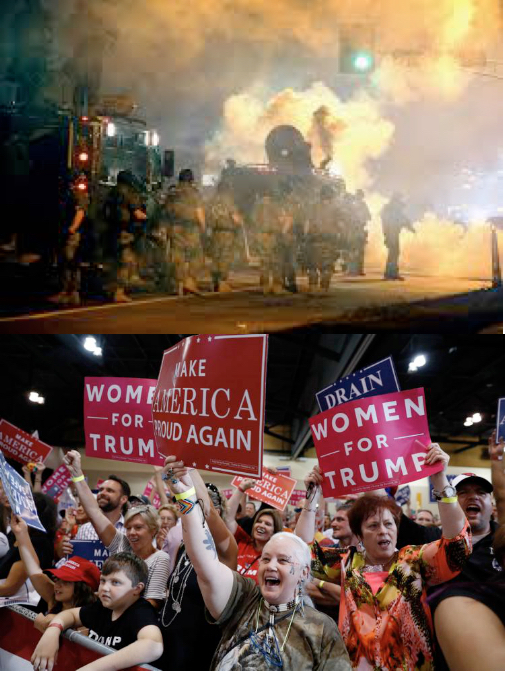 race riots – in the lead up to the 2018 or 2029 elections? Especially if it’s clear that the Democrats are about to overrun Trump and the Republicans at the polls, isn’t overt and generalized voter suppression possible? We’re not talking about some purging of the voter rolls, but for example massive call-up of the National Guard to ring every voter polling place, especially in working class – and most especially in black working class – neighborhoods. Or maybe in other neighborhoods if black and other voters decide to go elsewhere to protest. One way or another, a shock is coming, which means a real ferment within the very heart of the working class itself, not just on its fringes. The role of revolutionary socialists, of Marxists, is to continue to orient to the working class and continue to struggle to revive all the best traditions of the class struggle, of working class independence, and of the debate around perspectives and the next necessary steps for the working class movement. And to link that up with the necessity to bring down the capitalist system, root and branch, and replace it with genuine socialism based on working class control and management of society. “History says to the working class ‘You must know that unless you cast down the bourgeoisie (the capitalist class), you will perish beneath the ruins of the capitalist civilization. 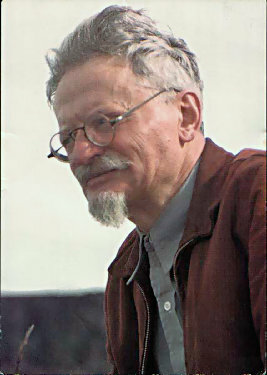 Try, solve this task!” Leon Trotsky, July, 1921.